My Long Long Entry Again!! 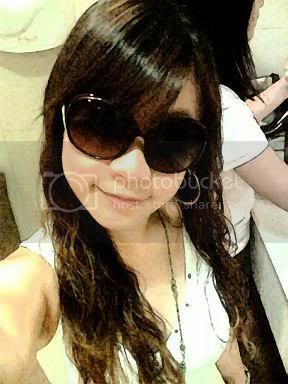 After alomost a mth, i sat dw b4 my lappy with aching arms and legs, typing my oh-so-long blog entry again.. I stopped blogging for so long, to an extend tt my blogger home aso dun recognise mi le..
Was going to gif up on blogging abt imf actually, since it has passed so long, but so many pictures i dun bear to forgo, so i sat dw this afternoon to edit and tidy them.. Hahaz.. 2033 now, Muz jia you and concentrate on blogging le.. Hahaz..
First few daes, I still gt update and keep track on the happings during work..
First dae of genuine work starts on 8th Sep which I initially tot was still training, in the end, we were told to clear used dishes & cups during a lunch buffet at the foyer.. 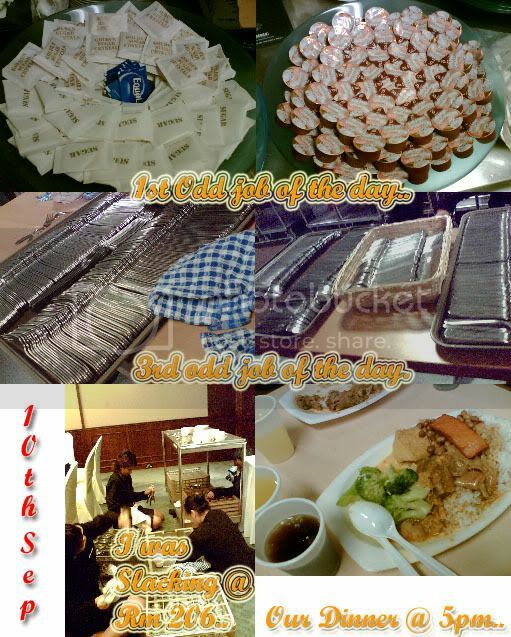 The 2 pathetic pics i gt during our break time.. Hehez..
On 10th Sep, wiping, prepare meeting rooms, forks & spoons, sugar & creamer sets preparation.. And soon, they became an everyday chores tt almost lasted till the end of IMF..
She treats mi very well.. Ask mi to follow her here and there doing small things, bring mi to level 6 to eat bread when i forgo my dinner to help her, treat mi mango juice in her office, feed mi VVIP breakfast sausages & turkey hams after the VVIP breakfast.. I <3 her loads.. The back of the house in Suntec Convention is a place we'll (the level 2 gers) will always treasure in our memories.. Especially our 2nd hm, the pantry.. Where we used to wipe stuff and slack during free time, gossips, drink tea & coffee and take pics..
TThe back of the house is where the i always almost slipped.. Well, i fall once in front of the stewarding office when i was going to collect some Long-neckteapots.. Hahaz.. Above are some of the pics I took during work and find it interesting to share.. The cannister were lined up by Michelle before they are filled up with coffe and hot water.. The cartons of water Syahidah and Mi were ordered to clear in meeting rooms at the last few daes of work.. Each rooms contain about 20+ cartons and we were expected to pull them out of the cabinets and push them to the back of the housr and unload from the trolleys.. Before tt, we were topping up fridges of water at level B1 and level 1 (it requires us to carry the cartons of water around too).. And each fridges needed about 10 cartons of water.. The $-$ faced mi beg Salimah to let mi off at 5pm tt dae and the next morning I went to work, everyone knows tt i cried, even Salimah and Mazrul and all my level 2 frens.. Hahaz.. 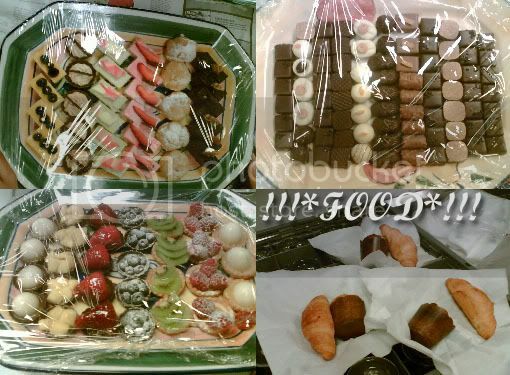 Thanks to Syahidah..
During work, we saw many mouth-watering food for the delegates, but after working for 2 weeks, we lost our appeal on them.. Hahaz..
One thing big about the cars used to fetch the delegates is tt, they are all BMWs.. 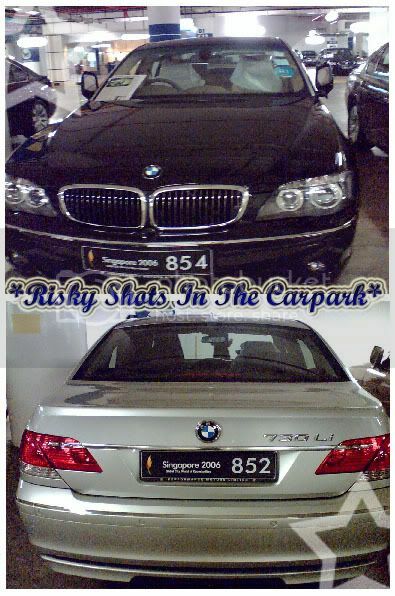 Imagine a carpark full of BMWs with different colours and special car plates.. Hehez..
Last dae of work was the enjoyable of all.. I start work at 9am and we were starting to tear down (clear) all the meetings rooms tt we once put in effort to set up.. In e evening, there was going to be a dinner buffet at B2 carpark, a "house" for the police force.. And it was so much fun getting all the plates and "equipments" needed for the dinner all the way from level 2 across B2 carpark..
Madah & I posed with the trishaw tt was strangely parked outside B2 cargo lift.. Hehez..
We were all "making fun" of the posters made by the protesters..
Michelle brought her camera.. Natually the pics I've gt haf her as the lead.. Hehez..
We thought the dinner will last from 6pm to 7pm and after tt, we will own all the food.. Hahaz.. 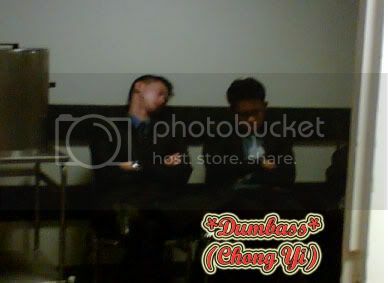 But in the end it drag till almost 9pm when ppl kept flocking in and the room was reli small to accomodate us and the ppl eating.. Squeezy!! Half of us left early after collecting the taxi claims, the $-$ ask Salimah to let mi stay again.. Hahaz.. So in the end left Mi, Syhidah, Madah, Mazrul and Yu Kin.. Salimah was with us all along.. Hahaz.. Sweets**..
Actually in the end, we didnt get to eat much of the food.. 1. No time 2. No appeal.. Hehez..
After getting back to level 2, I tried to sit at the lower compartment of the 2 tier trolleys and push from stewarding area to the pantry by Yu Kin and Mazrul.. Hahaz.. So fun!! Like going to have accident like tt.. Opps!! 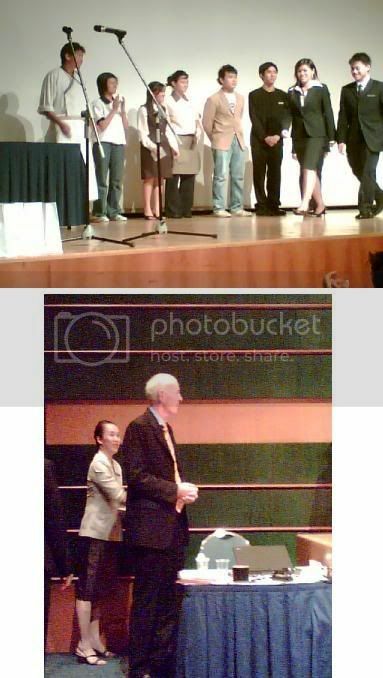 Hahaz..
On 22nd Sep 2006, Fridae, All the TP students and Suntec Workers were invited back to Suntec Level 2 theatre for a "ermm".. I dunno how to sae.. Hahaz.. There was a feedback by an angmoh, I tik he is the CEO or sumone in the mgnt level.. I dunno cos I was late! Hehez.. =P And speeches given by the representatives of Tp..
After tt, we were invited for some refreshments and also to collect our certs and return the Suntec Staff pass back.. We get to keep our IMF Pass!! 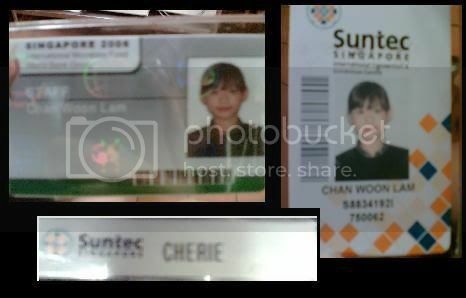 Hahaz.. Too bad, I left my Certs with Syahidah, so i didnt manage to take pics weith it.. Hahaz.. When I'm in the theatre, Salimah was already looking for mi, Hahaz.. 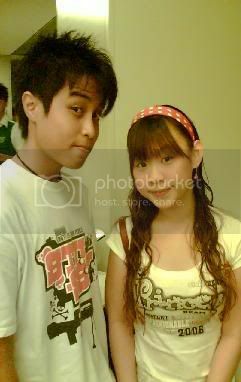 When I met her in room 209, she was so happy and excited.. Hahaz..
She said: "Small ger, aiyo.. Muz take care lehz.. Cant see you le." " Small ger, tml i ant see u lehz.. 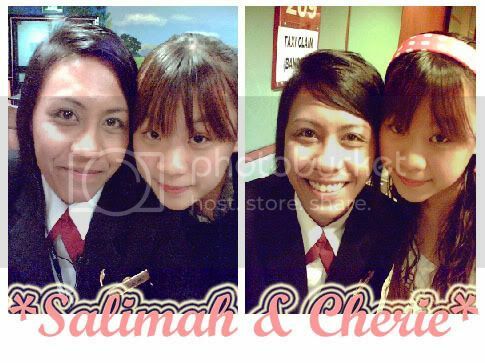 But i also nv work.. Aiyo.."
I miss my Ima!! 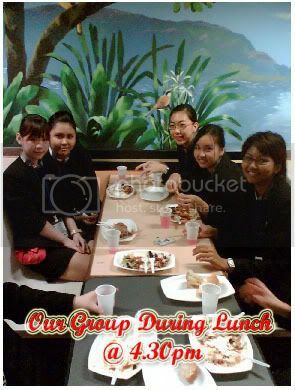 Muackiez..
Not forgeting Captain Salynna.. =) And the smallest group of us!! 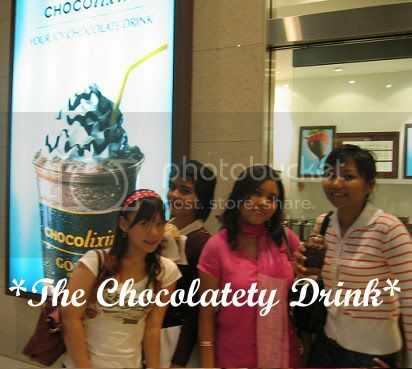 After Suntec, a few of us went to Godiva for the highly recommanded ice blended chocolate drink by Michelle..
Hahaz.. Quite expensive lohz.. $8 for a cup.. Hahaz.. 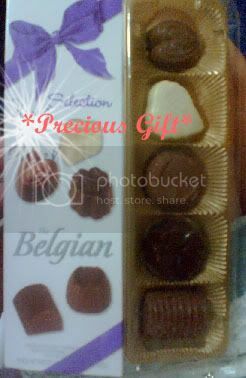 But next time I wil try dark chocolate with someone.. Hehez.. Tt 1 is more worth it! Hehez..
! IMF & working @ Suntec ended beautifully and fruitfully for everyone of us ! 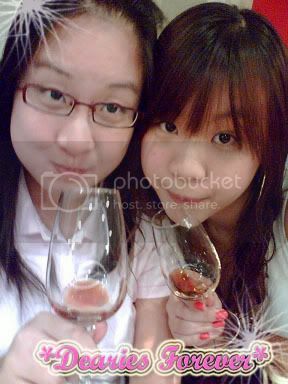 On 23rd Sep 2006, Saturdae, Adeline, Yang Ying, Eunice and I went for "ettusais" make up class.. Hahaz.. Actually it was a watse of time lahz.. Hahaz.. 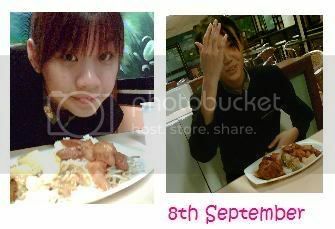 But the $20 we spent could be exchanged for other purchases.. Hahaz..
26th Sep 2006, Tuesday.. Dearie ask me for lunch.. So we met at Bugis at about 3 and had my lunch in Swensens.. Cos she had her lunch at home le.. I was damn late! Hehez.. I ordered my all time fav " Salmon mushroom pasta" amnd she ordered some seafood soup in bread.. Hahaz.. 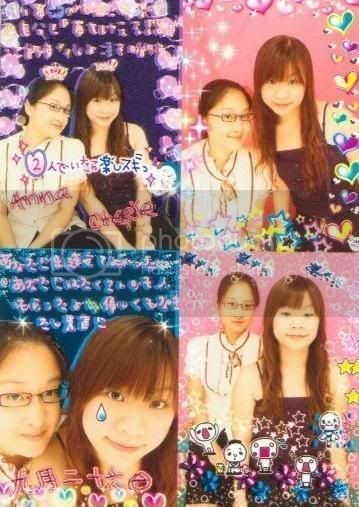 I dunno how to sae.. Hehez..
After tt, Ah siau (her bf) came and we headed to take neoprints (onli mi n her lahz) while he went wandering like a souless ghost.. Hahaz..
Dearie 1st time act cute till so successfully in a pic with mi.. I love this pic so much.!! Hahaz.. SoOOOoooO.. Cute right? 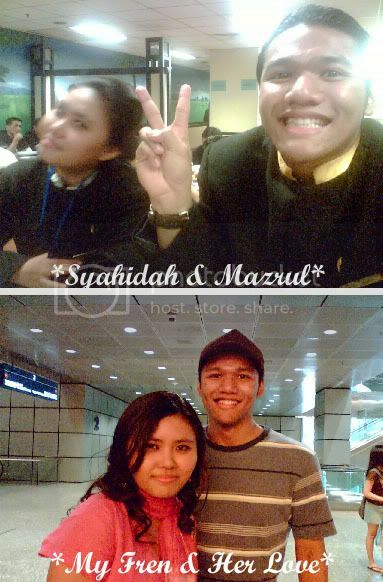 Hahaz..
Well, I failed in acting cute in the pic lahz.. Hahaz.. But i can act ermm.. Cool mahz.. Or perhaps Sunny!!.. Hahaz..
Hahaz.. It've been 1hr 20 mins since I sat dw to blog on this entry, I hope it's infomative enuff although it's not reli very long.. Hahaz..
Ade, u dun haf to worry u haf nth to read le.. Hahaz..
Wow! A great sense of achievement when mission is accomplised!! Till happenings events happen again..
U can aso call mi gun3 gun3 or small ger.. Hahaz..